The Southwest Through Wide Brown Eyes: Painted Hand Pueblo - Canyon of the Ancients. We had finished our shopping in Cortez (Walmart and City Market) and took Route 145 to the turn off to McPhee Reservoir; it takes about the same time in travel back to Monticello, but it's more scenic and relaxing this way. We were just about to pass by the Anasazi Heritage Center when I suggested we stop in to check out the brochures. Good thing we did! They had available a detailed map of Canyon of the Ancients, and pamphlets on Painted Hand Pueblo and Sand Canyon Pueblo; all for free! 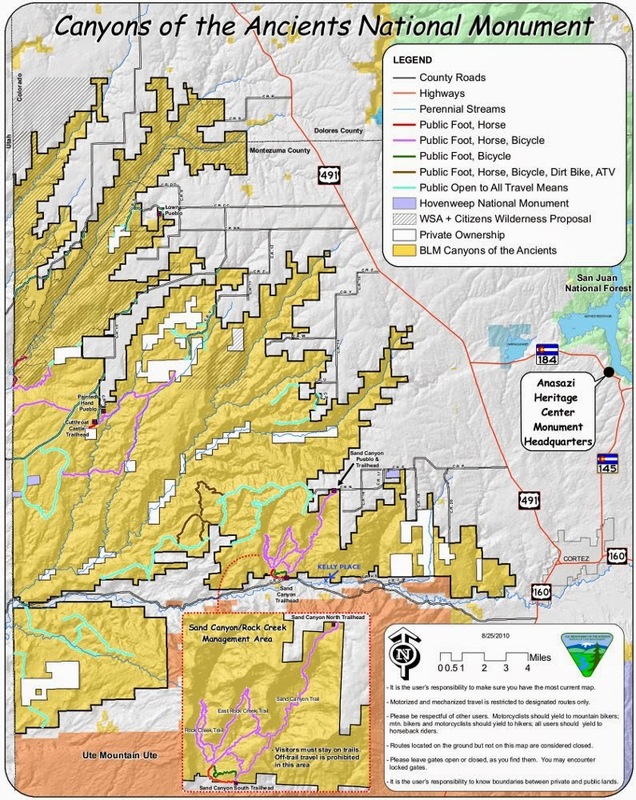 To better understand the pueblo sites you can drive, and do short hikes, to, I'm going to post two maps; the standard Canyon of the Ancients map, and a map I created using Utah's Canyonlands See & Do Map (available at the Monticello Welcome Center in Monticello, UT). When traveling east on Route 491 from Monticello, UT to Cortez, CO; MC RD BB is about a mile east of the small town of Pleasant View (this is also the road to Hovenweep National Monument), go six miles and make the left onto Road 10. For those who need to know, these roads are either a non-maintained paved road, graded (pounded down and leveled) dirt road, or a combination of both. It shouldn't matter how many miles is which type; you should only care about really going to see this awesome site, as well as the others. Anyway, stay on Road 10 to Painted Hand Pueblo (BLM RD 4531) for 11.4 miles (total is 17.4 miles from Route 491), then a mile to the parking area and start of the trailhead. The trail for Painted Hand is all natural; sand, dirt, slickrock and rocks; you will have to climb down over, and eventually back up, boulders. As soon as you begin walking from the parking area, you'll begin seeing the beautiful landscape of the canyon. Then comes the first sighting of Painted Hand Pueblo's Tower ruin; by the way, the entire trail is about a half mile roundtrip. After you take the trail to the Tower, don't be so quick to get back to the parking area, and I'll show you why after these photos of the Tower. So, why shouldn't you now climb over those boulders and get back to your vehicle? There is a path leading to the left, through the trees, that opens up to another ruin site, that's why! Don't be surprised to find you're being watched by the local wildlife; and take time to admire the flowers growing up from the desert floor. The Hopi that had built this pueblo and lived in this canyon area moved on to new places and have since passed; their descendants live on. Come to this area to enjoy the history, the landscape and the serenity. Unless something more pressing comes to mind, I will be writing about Sand Canyon Pueblo next.